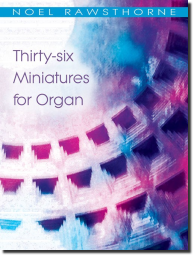 Noel Rawstorne has a rare and consummate ability to create organ music which sounds spectacular but remains easy to play. This collection of miniatures ranges from the ebullient and thrilling to the meditative and peaceful. All the features which organists expect to find in his compositions are present in abundance. This is a collection to be highly valued and greatly enjoyed. Now here they are under one cover, continuing to give pleasure to both organists and congregations alike.